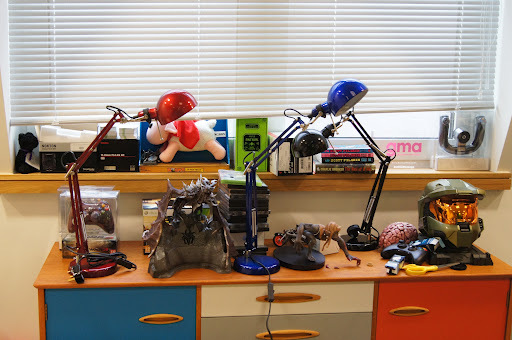 When I took the brief from Microsoft, it demanded cohesion of three existing set areas at its Soho studio. 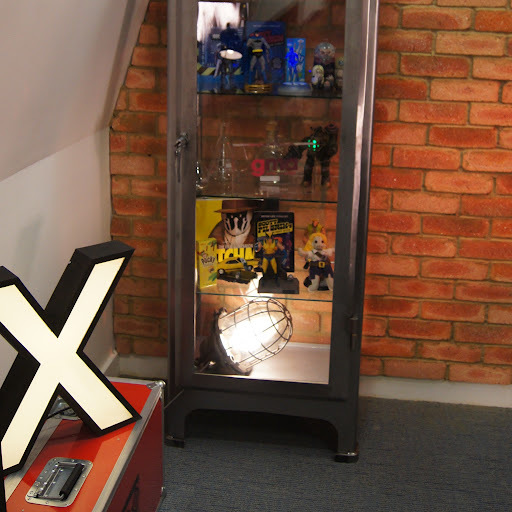 Here the technology firm films and broadcasts video game-related shows for digital TV channel ‘Inside Xbox’. Using 2K’s iconic gaming hit ‘BioShock’ and its beautiful ’30s interiors as inspiration, the client wanted to fuse retro and modern with an added dash of science fiction. Part of my job is establishing what items need to be on display, or how they should be stored. I edit together pieces that will be on show and put aside bits I can tuck away or place on other parts of the set for best effect. 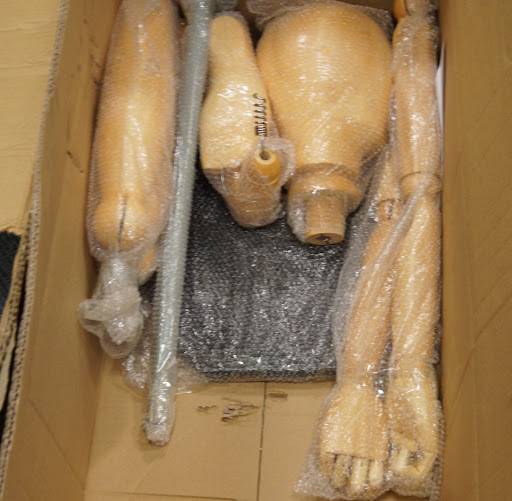 Installation day begins with heaving piles of boxes that need to be unpacked and the contents assembled. The giant wooden ‘manikin’ measures 1.8 metres – the size of an actual male adult and took three actual adults to put together. My styling kit contains a full complement of screw drivers, all manner of sticky tapes, glues, wires, markers, pins and tacks. If it can be bought in an art shop then there is probably some lurking in my kit. In addition to basic decorating tools, I carry an armoury of cleaning products, to make sure every piece of furniture or prop is wiped down and dusted before final styling. Greasy fingerprints ruin photographs and the darker the item, the more they show up. 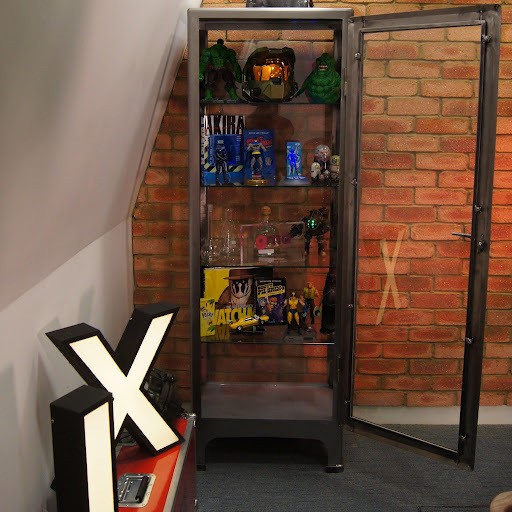 Storage formed a large part of the requirement, with Xbox needing somewhere it could keep props for filming, camera equipment and also somewhere to display memorabilia, superhero figurines and Gollum-esque models in all shapes and sizes. 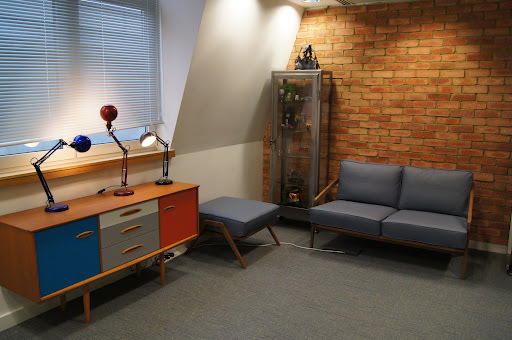 I sourced the antique metal and glass display cabinet from a company that specialises in vintage utility furniture, and commissioned a small designer to custom finish a G Plan sideboard for the additional space to store props. A brick wall also had to be commissioned, so I found brick slip tiles in an aged brick finish that we used for cladding. 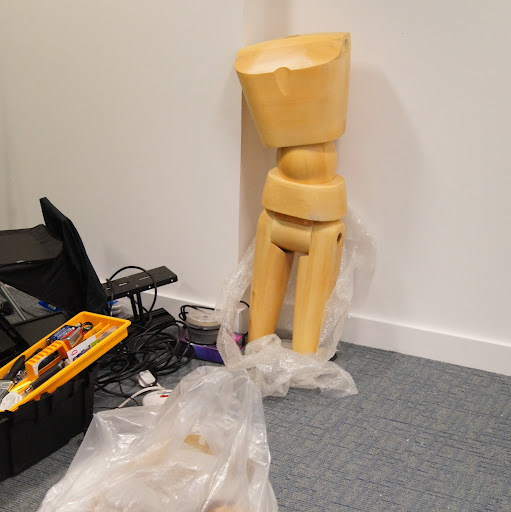 The life-size wooden ‘manikin’ will be used to display outfits of current video-game characters and I am told will be redressed for each show that airs. I stumbled across vintage illuminated signage letters from ’50s Germany to spell out the initials of ‘Inside Xbox’, which the client fell in love with. After searching high and low for the originals, I put together a dimension drawing and commissioned a signage designer to make some up for us. Interestingly, it is the same company that makes most of Vogue magazine’s lighting props for fashion shoots. Although expensive, the result was stunning. The set was already home to an ’80s arcade machine used to preview new releases. Placing the machine against the brick-clad wall lessened the harshness that this kind of object can have on a room. 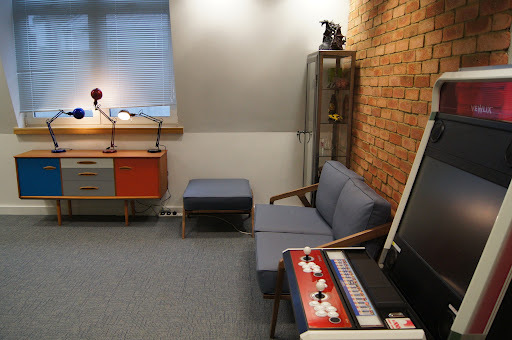 Key to this project was melding Xbox’s items with retro, utility and modern furniture to create a thirtysomething gamer’s dream loft apartment. Lurking in the bottom of the utility display cabinet is a Czechoslovakian factory steel pendant light that will be used as a set prop, and which was sourced from a company who specialise in architectural lighting salvage. The pendant is 35cm high and a huge 25cm in diameter and I was desperate to hang it up, but with it weighing in at 8 kilos, we weren’t entirely sure the ceiling would take it. 09 Feb	This entry was published on February 9, 2012 at 14:12 and is filed under On Set. Bookmark the permalink. Follow any comments here with the RSS feed for this post. 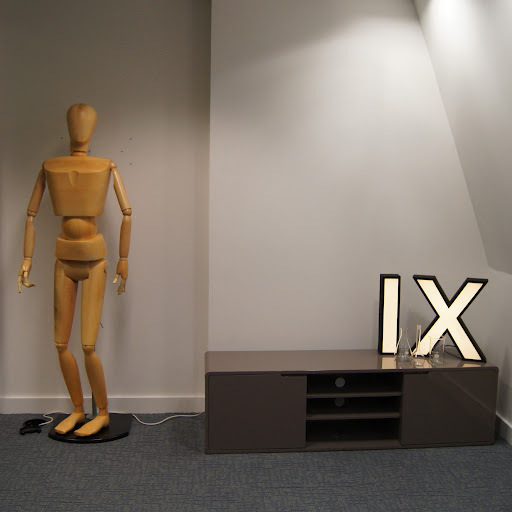 The IX sign letters are awesome. Just saw the new episode of SUAM, nice job on those.